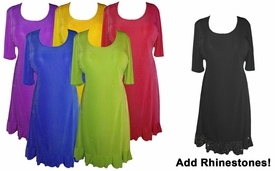 These are really lovely slinky's, available in all plus & super sizes Large to 9x! (check measurements listed below). Slinky fabrics are machine-washable poly/lycra blend, never wrinkle, and they hang like a dream! These flattering tops have a pretty ruffled hem, and in a princess cut! You can choose your own sleeves, length and color! And now, you have the option of adding rhinestones to the ruffles! 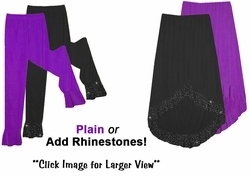 Ruffle Bottom Plus Size & Supersize Pants, Palazzos, Capris or Skirts Lg XL 1x 2x 3x 4x 5x 6x 7x 8x 9x!